Every month, individuals receiving income assistance from the provincial government receive their support payments on the same day, usually the last Wednesday of the month. Locally, this day is called “cheque day” or “welfare Wednesday”. Coordinated monthly social assistance payments, while often crucial to help lessen the health and social harms of poverty, can have unintended negative impacts, particularly among people who use drugs. 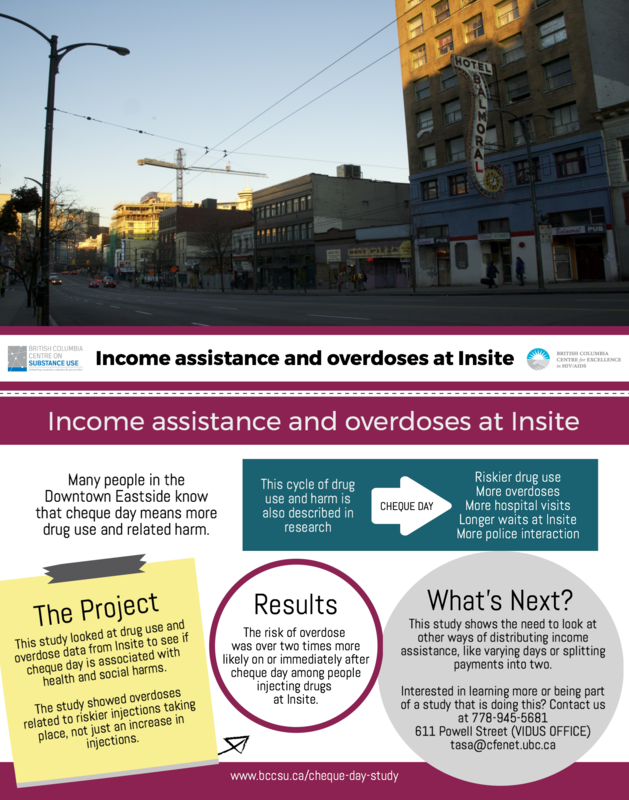 Research in Vancouver and elsewhere has identified sharp increases in drug use, overdose, emergency room visits, leaving hospital against medical advice, medical treatment interruption, street disorder, and other problems around cheque day. 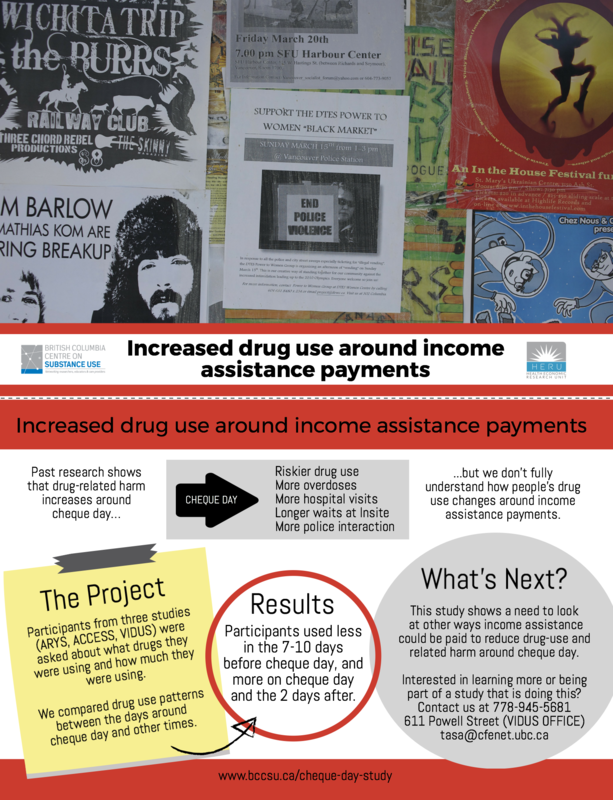 Receiving income payments of any type can act as a cue for increased drug use, and individuals may also experience strong social cues when many people in the community receive payments at the same time. 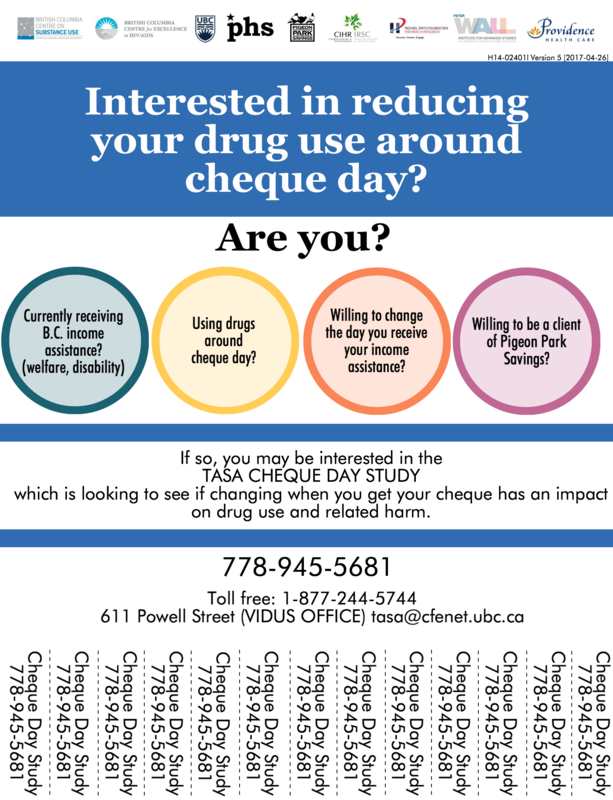 In addition to the harms experienced by people who use drugs, the increased activity each month around “Cheque Day” places significant demands on health, social, and financial service providers, as well as police. 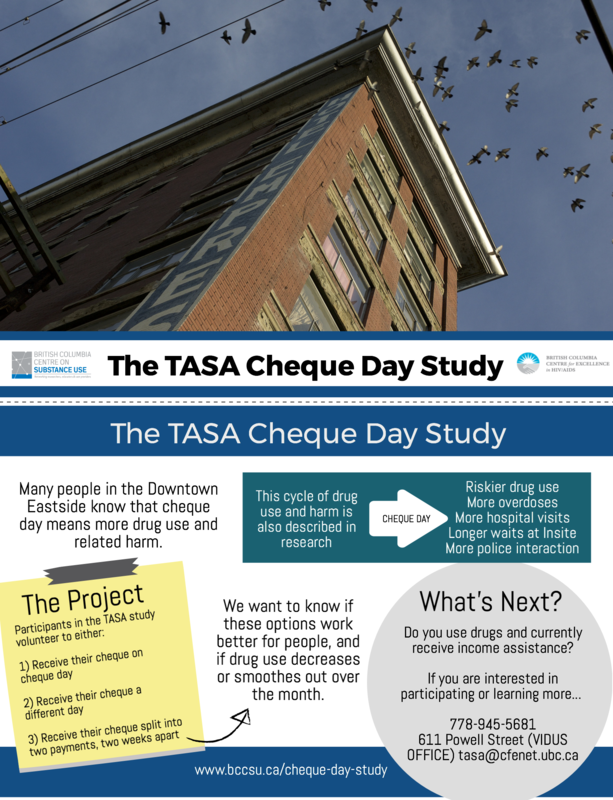 The Cheque Day Study (The Impact of Alternative Social Assistance on Drug Related Harm, or “TASA”) aims to examine whether changing when and how often social assistance is disbursed will benefit individual health and safety; decrease drug-related harm within the community; and decrease demand on health, social, and financial service providers, as well as police. This study uses both qualitative and quantitative methods to evaluate alternative approaches to distributing social assistance that may be able to mitigate these harms. Split and staggered intervention group: Individuals receive their social assistance split into two payments, on days that do not fall during government cheque week. Alternative social assistance payment schedules will be facilitated by TASA’s study partner, Pigeon Park Savings, a community branch of Vancity Savings Credit Union that is operated by Portland Hotel Society Community Services Society. Participants with alternative cheque day schedules will receive these financial services free of charge as part of the study, with measures in place to help each person adjust to their new disbursement schedule as smoothly as possible. 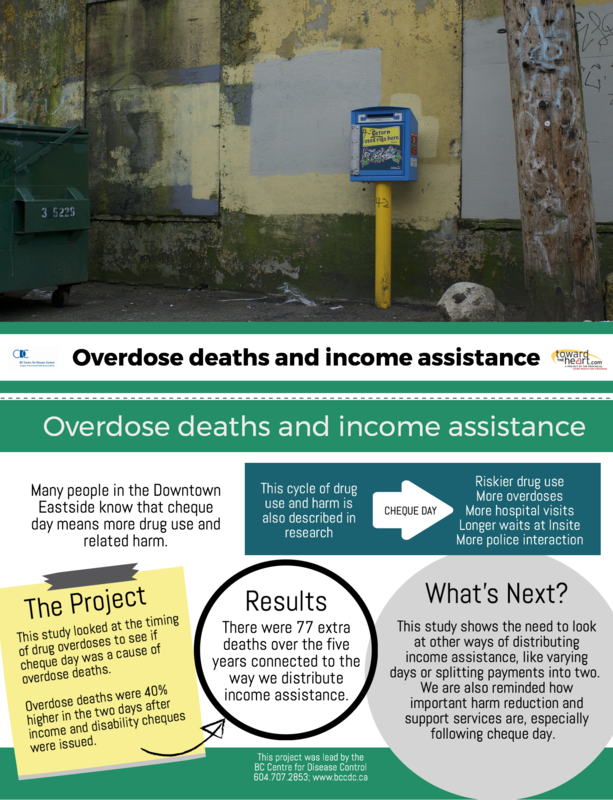 Decreased drug-related health, social, and economic harm (e.g., overdose, health services demand, police interactions, treatment interruption, etc.) on both government and individual cheque issue days. INTERESTED IN FINDING OUT MORE ABOUT TASA? if you would like to be kept informed when results are available.